Read on to learn the top ten benefits of playing an instrument, like the ukulele. First, let’s start with the physical benefits of learning to play an instrument. The strings on the ukulele are very fine, and you have to constantly pay attention to which ones you are plucking in order to play the right note. And the exchange of information from telling your brain what note to play, to sending that message to your fingertips, needs to happen fast. Because of this, playing the ukulele can seriously help improve your hand-eye coordination. Having better hand-eye coordination can help you on the athletic playing field, as pretty much every sport requires you to have some level of hand-eye coordination. Plus, increasing your coordination can also increase your reaction time. This is because you have to constantly be reading music while playing it at the same time. Your fingers need to react quickly to what your brain says in order to keep playing the right notes. This one is kind of crazy, and scientists still aren’t exactly sure how this happens, but playing a musical instrument can also help improve your immune system. Some believe this is because playing an instrument helps to lower stress levels. And with lower stress levels, your immune system grows stronger. When you are extremely stressed out, your heart beats faster, which tells your immune system to worry and put your body on high alert. The other theory is that because playing music enhances our creativity, our immunological response is enhanced. This enhancement allows our bodies to better fight off viruses. As we just mentioned, playing the ukulele can help lower your stress levels. And while many people think of stress as something that affects our mental health, it affects our physical health as well. Playing the ukulele is a great way to de-stress and avoid these negative physical symptoms. Speaking of stress relief, here’s a video of very relaxing and calming ukulele music. Did your mom and dad use to always tell you to sit up straight at the dinner table? Well, once again, Mom and Dad were certainly right. Having good posture is very important, and playing a musical instrument is one of the best ways to train your body to have good posture at all times. This is because good posture makes it easier to play an instrument. But, what’s so bad about bad posture? Many people think bad posture simply means you are more susceptible to having a slouched figure when you are older. But, there’s more to it than just that. Playing an instrument can be one of the best ways to train your body to naturally sit up straight and avoid these negative physical effects. Playing the ukulele is also an excellent way to improve your fine hearing skills. This is because, when playing an instrument, you are training your ears to continuously isolate sounds as they occur. There have even been studies conducted that prove musicians are better at picking out specific sounds in noisy environments. 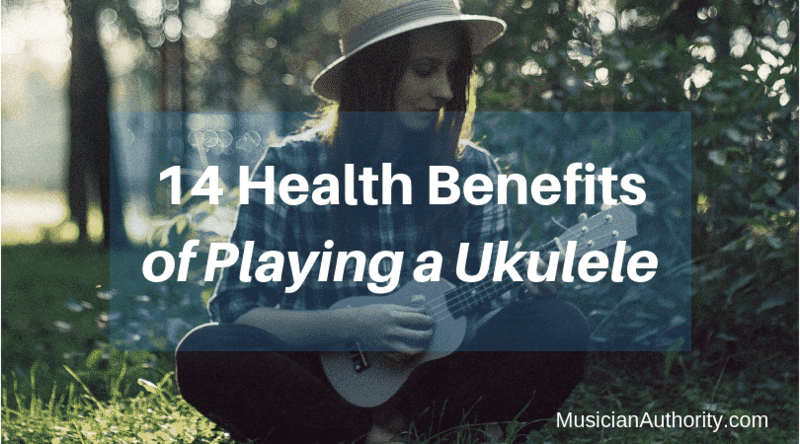 While this isn’t a benefit of playing the ukulele, it is worth mentioning that playing a wind instrument can improve your respiratory system. This is because you need to take huge breaths in order to play these types of instruments correctly. In order to make sure you are using enough air, it is recommended that musicians do breathing exercises. Continually doing these exercises can help improve your overall respiratory system. When playing an instrument, you are often sitting down, so what does that have to do with exercise? While you may be sitting down, there are many instruments, such as the ukulele, guitar, and piano, that require you to use your back and arm muscles to either play the instrument or to hold it up. Plus, there are some instruments, like the drums, that are an actual workout when you play them. Now that we’ve covered the physical benefits of learning to play the ukulele, let’s take a look at some of the mental ones. Mastering the art of playing the ukulele, or any instrument really, is pretty much the brain’s equivalent of training for and running a marathon. When playing the ukulele, you are constantly exercising your brain muscles. This is the best way to keep your brain healthy. In fact, one study even found that musicians actually have a lower chance of developing memory issues, and they even have a lower chance of developing serious memory illnesses, such as dementia. Playing the ukulele can also be a great way to improve your math skills. This is because reading music requires you to count both notes and rhythms. Plus, when learning to play an instrument, you will also be learning musical theory. Music theory has many mathematical aspects to it, and understanding these theories can help you better understand other mathematical theories that you learn about in school. In fact, studies have actually show that students who play musical instruments are often better at math and achieve higher grades than students who don’t play instruments. If you’re looking for a fun way to improve your reading and comprehension skills, then playing the ukulele is the way to do it. One study found that children who were exposed to a multi-year music program demonstrated better reading and comprehension skills than those who were not. This study should not really come as a surprise, as learning to play an instrument requires you to constantly be reading notes and comprehending their meaning. Do you feel like you sometimes have trouble focusing on certain tasks? Do you wish you were the type of person who could start something and see it through to completion, without constantly getting distracted? Better concentration skills are something many of us wish we had. If you are looking to improve your concentration skills, playing the ukulele is one of the best ways to do it. This is because playing an instrument requires you to be hyper-focused. You need to be constantly paying attention to things like rhythm, note duration, pitch, tempo, and sound quality. Any minor distraction will diminish your quality of play. For those with ADD or ADHD, playing the ukulele or another instrument can be especially beneficial. Last but certainly not least, playing the ukulele can also be emotionally beneficial. Let’s take a look at a few ways it benefits you emotionally. There is perhaps no better feeling than the feeling of mastering a new skill. Setting a goal to learn something, putting in the work, and eventually reaching that goal can give you a strong sense of achievement. This strong sense of achievement you get from learning to play the ukulele can carry over to other parts of your life, making you feel more confident in other activities. Playing an instrument is a great way to boost your mood as well. In fact, studies have shown that playing an instrument can help you deal with depression, stress, and insomnia. This is because it acts as a positive outlet for negative emotions. Plus, when you learn to play an instrument, you have the chance to perform for others and make them happy as well. Knowing that you’re elevating other peoples’ moods is perhaps the best way to elevate your own mood. Surrounding yourself with positive, like-minded individuals is a great way to improve your emotional well-being. When you learn to play an instrument, you open yourself to a whole new community of people, who also share your love for music. You will maybe even get the chance to join a band or an orchestra. Or, you may find that playing an instrument simply helps you connect with friends and family members who also play instruments. Now that you know all the benefits of playing an instrument, it’s time to get strumming. Whether you’re an expert ukulele or guitar player, or you’re just starting out, be sure to check back in with our site. We’ve got tons of information to improve your skills as a ukulele player, such as this blog post. And, if you have any questions about this article, be sure to drop us a comment below.